9th Annual Chef Showdown 2013 - San Diego Dining Dish! I can't wait for this! My friend was lucky enough to be able to attend last year, and it was phenomenal! And for a great cause!!!!! 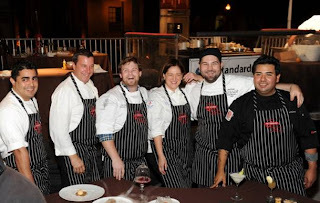 DATE/TIME: Thursday, September 26thfrom 6 to 9 p.m.
During this charity event, 10 of San Diego’s top chefs (listed below) will come together for an entertaining Iron Chef-inspired culinary competition. Two teams will incorporate one secret ingredient into eight original dishes, to be judged by a panel of well-known San Diego chefs and restaurateurs (listed below). Proceeds will benefit CCS’ domestic violence prevention and intervention programs and services. Guests will receive sample food portions and lively course-by-course commentary by Sam Zien of the television show Sam the Cooking Guy and Marcella Valladolid of the Food Network’s Mexican Made Easy. Entertainment will include music and live video projection of food preparation; guests can bid on silent auction items. Chefs involved include: Anthony Sinsay of La Villa, Amy Dibiase of Baleen, Joe Magnanelli of Cucina Urbana, Lori Sauer of George’s at the Cove, Percy Oani of The Shores, John Bautista of Kitchem 1540, Benito Molina of Manzanilla, Drew Deckman of Deckman’s, Flor Franco of Indulge Contemporary Catering and many more! Tickets can be purchased for $125 by calling (858) 272-5777, ext. 120 or at www.ccssd.org.